Hola! I'm backed in the ATL feeling refreshed and relaxed from hanging in Panama City Beach for a few days. Let me tell you...I like it there. I will be visiting again, but not during spring break. When it was decided that Panama City Beach will be the destination of choice, my immediate thought was like..."Oh, great another place where a swimsuit will be needed" see for the past couple of years or so, I have tried my hardest to avoid going places where a swimsuit is needed, because I am very insecure with my body at this point in my life. Did I say very insecure? Actually, I have not been in a swimsuit in about 15 years or longer. But today-at my heaviest weight-I have refused to put on a swimsuit up until this past week. I said to hell with it and purchased me a swimsuit and let me tell you I am so glad I did. 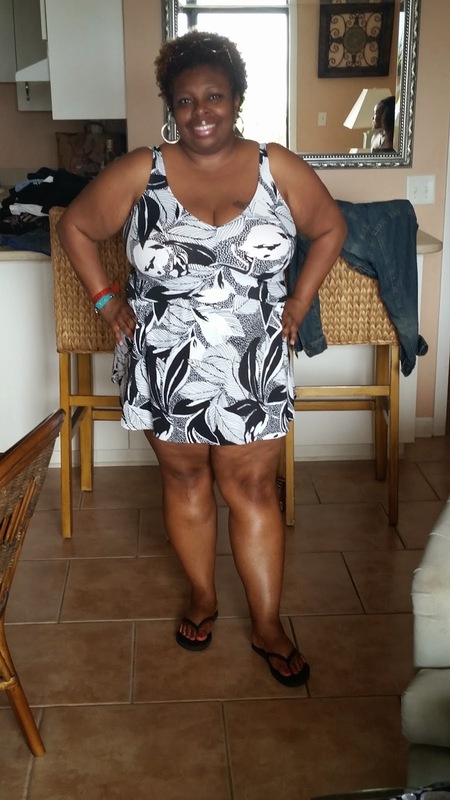 In this swimsuit I did not feel a bit of insecurity..it had just enough of coverage (skort part) for me to where I did not need a cover-up. I felt good walking to the beach and pool with everyone else in proper beach/pool attire. I still have some work to do on my insecurity, but this was a big, big step for me. Sometimes it's hard loving the skin you're in. Do you have an insecurity you are currently trying to get over? It's good to know you had a wonderful time at Panama City Beach. The thing about swimwear in our culture is that we've been conditioned to believe that women's bodies have to be near "perfection" (whatever that means) before we can even buy, much less wear one in public. I'm a victim of that self-deprecating thinking too, so it's something that I definitely have to work through as well. All that to say, you look GREAT, Bobbie! Heyyyy Danyelle! I had a ball...like literally. I went back to work and my co-workers were like....you look so refreshed....and I am. It was much needed. Girl, my blog makes. Me want to blog more consistently now, so I guess the change was a good thing, huh? Lol... Thank you, thank you, thank you for all the compliments stated here...it means so much. Show em' how to do it, Bobbie!!! You're one beautiful lady and you look GREAT in that suit! I love PCB! We haven't been in years. Can't wait to go back! You look great!!!!! I commend you for stepping outside of your box. I wish we all could do that. Thank you for reminding us to not forget to accept and love ourselves, the way we are in each moment. Frankly, I don't think that you had anything to worry about. Did you have a bodyguard????? This was so beautiful! You look great, and most importantly, you look happy! :D We all have insecurities, mine is facial hair. I have unwanted facial hair. It used to make me so insecure, and i still am slightly til this day. I dont like anyone touching my face even if its a boyfriend. :/ but i'm just very on top of my skincare to prevent bumps & etc. very inspiring story! god bless you! **waving** hey Chrissie! Thank you so much for the compliment. Girl, lets not talk about hair. I have a little of that too..the girls in my family was cursed with it, smh! So, I feel you!!! Yay Bobbie! I think ALL women have some sort of insecurity about their bodies, but screw it! We are who we are. That swimsuit was perfect on you! I was just there a great lil getaway!